have you seen yellow chard? maybe a recipe for yellow chard bruschetta? so...today it is sunny, warm and beautiful in napa...yesterday it poured. it was 38 degrees last night...probably will get to 70 today...going to rain all next week. welcome to spring in the napa valley. cooking is tricky right now...i am longing for spring produce....but still welcome roasted vegetables...stews...chili...the perfect dishes to warm you up when it is cold...what to do? my solution...as always...is to cook seasonly. i try to use only locally grown, in- season produce. my exceptions are the items impossible to grow in the napa valley. (example, bananas.) this way i can follow my favorite way of menu creation. go to the market (farmer's market when it is open)...select items purely based on what looks good that day...and then create the meal. i can't tell you how often i wander around the aisles making up dishes along the way. the napa farmer's market is open may 1st through end of october....i keep hoping this will become a year-round market...maybe one day? in the interim, i am a whole foods junkie. i have told you before that...for me...fresh produce is like a work of art...the look, feel, smell...and taste... makes me very happy...and i love discovering an unfamiliar, heirloom variety of a common ingredient. today i found yellow chard....oh my! i love greens...all kinds. they are delicious, healthy, extremely versatile and look beautiful on the plate. soups, stews, bean pots, sautés...all are enhanced by greens. but...back to the yellow chard...it was gorgeous! bright yellow stalks and veins...and lovely green leaves. i snapped up a bunch...and now the fun began. spring garlic is in season...yeah!...so i grabbed a few stalks. fresh leaks were next to the garlic so...in the cart. i thought the chard, garlic and leaks would be fantastic sautéed together and decided to make an easy-breezy bruschetta supper perfect for the winter-into-spring weather. the chard mixture served over thick slices of sourdough or french bread topped with parmigiano-reggiano cheese shavings...how great does that sound? for me...the perfect meal...just add a glass of wine...but i knew peter would want a little bit more...so i added sea scallops poached in infused lemon grapeseed oil to his plate....really, really good! i encourage everyone to seek out unfamiliar produce items...especially the heirloom varieties...you never know what you will find. and if we all support the farmer's who grow the unusual ingredients, we can ensure the fruit/vegetables do not become extinct. there is something about the heirloom varieties...they just taste better...and...trust me...find the yellow chard!! 1 bunch chard...yellow if possible...if not any kind you like. cut chard stalks from leaves. slice stalks into thin disks the same thickness as the garlic and leeks. chop chard leaves into bite sized pieces. stirring often, 6 to 8 minutes until soft. add spring garlic and sauté 2 minutes until garlic is soft and fragrant and just beginning to brown. add the chard leaves, 2 tbsp e.v.o.o., aglio olio peperoncini and salt/pepper to taste to the pan, stir well, and cover. cook over medium heat for 10 minutes, stirring occasionally. meanwhile, grill, broil or toast the bread in the oven. i use 2 pieces per serving. drizzle each piece with extra virgin olive oil. mound the chard mixture over the bruschetta and top with cheese. drizzle additional e.v.o.o over top if desired...serve immediately. let's see...it is nearing the end of march. what local produce is in season in your area?....what are you cooking these days?? and...before i forget...there is a new csa based in napa starting up in april...i am joining and can't wait to share the recipes created from whatever is in my box each week....so much fun! napa farmhouse 1885™ "live a green life of style™ "
"On Foodzie you'll find fabulous food and beverages made by small food companies. Many are foods you can't find anywhere else. They're all special in some way, whether handmade, following old family recipes, incorporating unique ingredients, etc. We work closely with the companies you see on Foodzie, to make sure what you buy here is food that we ourselves would enjoy, crave, and want to give as gifts." ok...by now you are probably wondering why i have not yet added the link to foodzie...i will...but later in this post. otherwise you will click over...get caught up in the site...and never finish this story. really...if you are into amazing food...you will love foodzie. so, being accepted by foodzie is no mean feat...you have to meet their requirements via an application, then send them samples of all your products which go through their "tasting panel" and their "packaging/branding" approval. throughout the process, i worked with susie, their "Food Artisan Relations Manager" (talk about a cool title! )....who was so amazingly supportive and helpful...and welcomed by emily olson, co-founder of foodzie. emily told me about their newest concept...the foodie test kitchen...where they take a product which is a bit unusual...experiment with different recipes...and share on their blog(and readers get a discount on the product for a limited time)...she told me they had selected one of my products...our persimmon jam...to be the first featured item...how cool is that? emily then introduced me to steven gdula a fellow food producer who is also a food writer and published author. steven told me he fell in love with the jam...he made me laugh out loud when he said he ate half the jar on rice crackers! !...but then told me about the salad vinaigrette he created using the persimmon jam. i immediately tried it and...well...let me put it this way...lately we have been having salad with persimmon jam vinaigrette almost nightly...it is so, so good. There are some products on Foodzie that need little introduction or explanation. You see an artisan chocolate bar, insert in mouth, and enjoy – easy! There are many other interesting finds that should work their way into your pantry and into your weekly meals, but maybe need some inspiration. The Test Kitchen is our place to experiment with these products and come up with fun creative ways to use every last drop. So here’s your quick introduction to Steven, a Foodzie producer, food writer, and passionate food enthusiast who gets to have the fun in the kitchen. Step into the Foodzie Kitchen with Steven! I am not afraid of food. But I will admit to being cautious when it comes to the matter of food prices. Especially in the last year or so. But with food being a source of joy in my life, as well as sustenance, I needed to find a way to cut costs without severing all ties to my passion. My solution? To make the most out of every food item I brought into my kitchen. I needed to be more than adventurous; I needed to be frugal. This new approach turned my pantry into a new world of opportunity, and it also allowed me to get even more enjoyment, not to mention satisfaction, from the foods I loved. I’ll be sharing my discoveries, and recipes, here. Sometimes I know I’m going to love something even before I taste it. That was definitely the case with the Persimmon Jam I recently opened from Napa Farmhouse’s 1885. There was something whimsical, yet earnest about the jar’s packaging and I knew the flavor inside wouldn’t disappoint. I snapped off the lid, dipped in my spoon – and then immediately had to restrain myself from reaching for a larger spoon. Made with hachiya persimmons, the jam had a rich, pudding-like texture that instantly made me want more. I had slathered it on, oh, about half a stack of brown rice cakes before I realized my spoon would soon be clanking the jar’s glass bottom if I didn’t exercise some control. So I put the lid back on the jam and distracted myself from devouring the rest by focusing on the product itself. “The trees are really, really old. They were here when we purchased the home,” Diane Padoven, founder and president of Napa Farmhouse 1885 told me.Well, no wonder this jam was so good: Not only had these trees perfected their craft, their produce was now “sustainably grown” in the loving and capable hands of Diane. I thought about the Persimmon Jam for the rest of the day and was practically giddy when I realized I could have it again with dinner, this time in the form of a flavorful vinaigrette drizzled over my salad. The recipe follows. I also highly recommend this as a dipping sauce for grilled chicken. The richness of the persimmon is a perfect foil to the charred smokiness of the meat. Serving size: About a cup and a half. 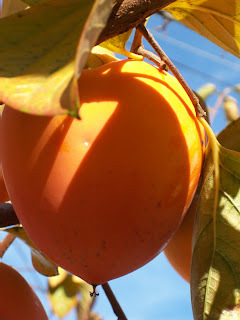 Place the persimmon jam, vinegar, lemon juice and mustard in a bowl or a small food processor and whisk (or whir) to combine. Slowly add the oil, whisking constantly until blended. Serve over a salad that has some bitter leaves in it such as radicchio or endive. Toss in some hazelnuts and, as Diane’s suggests, crumble some feta overtop. Drizzle the dressing over the mixed greens, toss, and enjoy! Store in a cruet with a stopper or an airtight container for up to two weeks. Shake well before each use. Food writer, published author and Foodzie producer, Steven Gdula, will be helping us to create a Foodzie Test Kitchen in the coming months. Steven’s double duties as a vendor with a product as well as a food writer gives him a unique perspective on the roles of producer, product and consumer. Steven will chronicle his adventures in and out of the kitchen here on the blog. You can read his work at thewarmestroominthehouse.blogspot.com – the companion blog for his book,The Warmest Room in the House – and also at http://gobbagobbahey.com/ – the home page for Steven’s gobs etc. (a whoopie pie-like confection popular in Pennsylvania.) "